Publishing applications from RDSH servers was one of the big additions to Horizon 6.0. Horizon 6.2 greatly expands on this feature set, and it offers many new capabilities under the covers to improve the management of the environment. 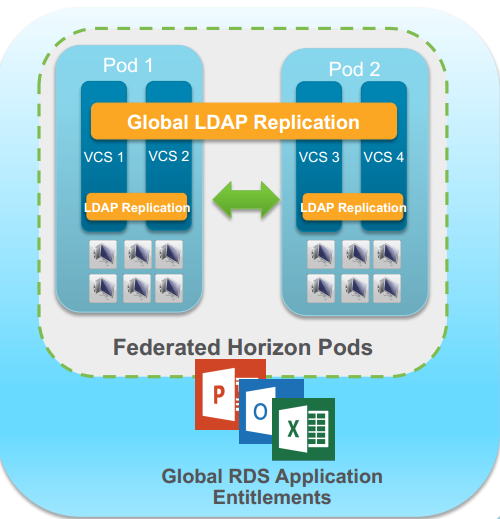 Horizon’s Cloud Pod for multi-datacenter architectures has been expanded to include support for RDSH-published applications. Users can now be entitled to an application once and access them across Horizon pods and/or datacenters. 1. The load balancing algorithm utilizes Perfmon counters to determine which hosts are optimal for starting new sessions. The View agent runs a script to collect system performance data, and it reports back to the connection servers with a recommendation based on the system’s current performance. A server placement order is calculated based on the data that the View Agents return. 2. Application anti-affinity rules will look at the number instances of an application that is running on an RDSH host. If the number of a particular application is higher than a predefined value, user connections will be directed to another host. Application anti-affinity rules process after the server placement order has been determined. There are a couple of things to be aware of with the new load balancing algorithms. First, they only apply to new sessions, so if a user already has a session on an RDSH server, they will be reconnected to that session and be able to launch any application, even if it violates an anti-affinity rule. Application anti-affinity rules also do not apply to RDSH desktop sessions. If you had wanted to build an RDSH Farm for Horizon 6.0, you would have had to build, deploy, and manage each server manually. There was no built-in way for managing server images or server updates. This could also be an inefficient use of storage. Horizon 6.2 changes this. Composer now supports linked-clone RDSH servers. This brings the benefits of linked-clone desktops, such as automated pool builds, single image management, and system and application consistency, to server-based computing.